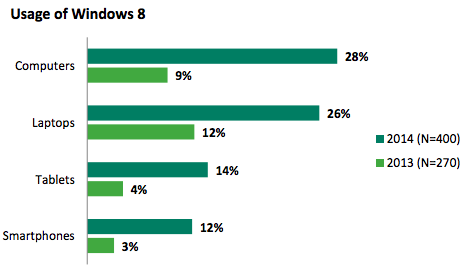 Windows 8 is winning a good chunk of the Canadian market when it comes to business PCs and tablets, according to a new survey from Sage Group PLC. Microsoft Corp.’s newest operating system was only installed on nine per cent of desktops and 12 per cent of laptops a year ago, but has now grown to 28 per cent of desktops and 26 per cent of laptops, the survey shows. Sage conducted its SMB survey on mobile devices 2014 between April 18 and May 4 of 1,628 Canadian small to mid-sized businesses. The poll may reflect a migration to the new operating system after the popular Windows XP saw its end of support date pass on April 8. Left without security updates from Microsoft and without third-party support from other software vendors, it’s possible many businesses felt the time was right for an upgrade. Canadians are using mobile devices for pretty much what you’d expect, working from home or “in the field” with a tablet or smartphone, according to a survey. They are using email, text messaging, organizing contacts, checking their calendars, and doing banking transactions with their mobile devices, among other activities. 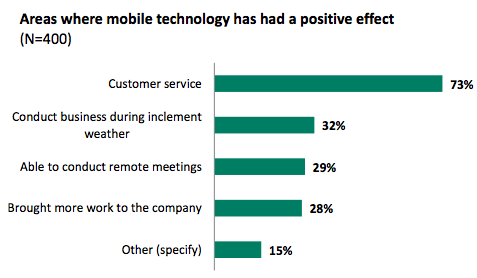 When asked where mobile technology had the most positive impact, most businesses identified customer service (73 per cent). That was by far the most positive answer, followed by conducting business during bad weather at 32 per cent and conducting remote meetings at 29 per cent. Canadian workers are more likely to be supplied a mobile device by their company than their American counterparts. Sixty-three per cent of Canadian businesses supply mobile devices to employees while only 54 per cent in the U.S. do the same. Still, fewer Canadians are getting help from employers to buy mobile devices in 2014 – 71 per cent of businesses reported supplying them in 2013. About four out of five Canadian businesses don’t create an annual budget for mobile devices, but buy them when needed. Only seven per cent of businesses said they set an annual budget and stuck by it.